Inspired by my own article on side-loading ebooks on Kindle for Android I wanted to know how to do it for iOS-based devices like the iPhone, the iPad, or the iPod. It seems that the possibilities are on the one side different but on the other side somehow 'richer' compared to Android. First of all, due to the 'walled garden' concept in iOS you can not simply hook up your device to your Mac or PC and transfer the files 'as-is'. This is the major difference to Android which is a huge drawback according to my perception but not too bad after all for the majority of users in general. 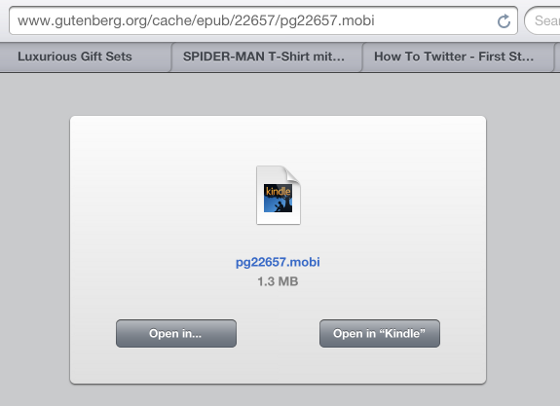 Furthermore, the various methods to side-load an ebook to your Kindle app have been evolved. Mainly because several hacks from the old days became obsolete due to updates on the app itself. This is pretty positive that the app developers over at Amazon are taking the feedback of their users into consideration and enable more features over the time. Either way your book is going to show-up in your library. Most probably without a cover image. But iExplorer seems to require the installation of iTunes which brings us to the situation that this method about iPhoneExplorer or nowadays iExplorer is actually obsolete. So, in case that you are only interested to side-load your Kindle titles to your iPhone, iPad or iPod don't bother yourself with the application. Otherwise, it's a great piece of software to control other parts of your devices, too. This might be the easiest version after all. Connect your device via USB, navigate within iTunes to Apps > File Sharing > Apps: Kindle > Kindle Documents and simply drag & drop your MOBIs from Mac Finder or Windows Explorer there. Or choose your files via the Add... dialog. Of course, always assuming that you are actually having a Mac or Windows system at your fingertips. This looks completely different while running on Linux. 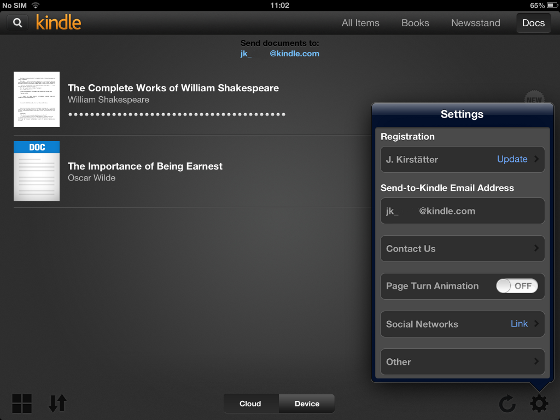 Since Kindle version 2.5 (~ November 2011) it is possible to use the registered app features directly on your device. Access millions of free and out-of-copyright books from Project Gutenberg, Internet Archive, and other online sources. 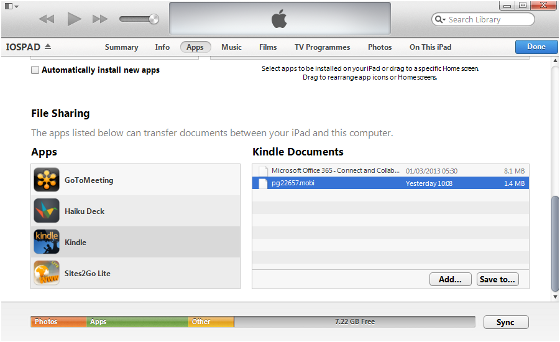 Open supported files from Safari and Mail or use File Sharing in iTunes to transfer files to your Kindle app. "Download Failed - Chrome cannot download this file. Error 102 (): Unknown File Type." - Thanks for that! As already mentioned in the Android experience your Kindle for iPad app or your Kindle for iPhone/iPod app has the ability to receive documents (in)directly through your Amazon's Cloud storage. Either you change to the tab 'Docs' (Kindle for iPad, might be different on iPhone/iPod) or you open the Settings menu in your Kindle app to discover your device-specific 'Send-to-Kindle Email Address'. Next, send an email to that particular mail address with your MOBI file or any other kind of document as attachment. Wait for some minutes and synchronise your device. All described methods are very simple to follow and sideloading your own Kindle ebooks on your Kindle for iPad app isn't really an issue anymore as it used to be in the past. Thanks to standard features in iTunes and the 'Send-to'Kindle' mail delivery you can quickly enjoy your books on any iOS-based device. Upgrading your Xubuntu machine from release 12.10 to 13.04 is straight-forward and takes a few steps only. Upgrade today! Using the freely available Kindle reader apps allows to add and read any additional content, not only titles from the Kindle shop.